Go for a pared down yet cool and relaxed option by marrying a navy parka and Philipp Plein Fix You Morgan Fit Jeans. And if you need to immediately play down your outfit with a pair of shoes, introduce brown uggs to the mix. Try pairing a grey coat with Philipp Plein Fix You Morgan Fit Jeans from farfetch.com for comfort dressing with a modern take. Complete this ensemble with a pair of pink suede heeled sandals to kick things up to the next level. For a cool and casual outfit, try teaming a red knit turtleneck with blue ripped skinny jeans — these pieces go really well together. Beige leather mules will add a more elegant twist to an otherwise everyday outfit. For something on the casual end, test drive this combination of a yellow sleeveless coat and Philipp Plein blue ripped skinny jeans. Complement this look with a pair of tan suede heeled sandals for a dose of elegance. 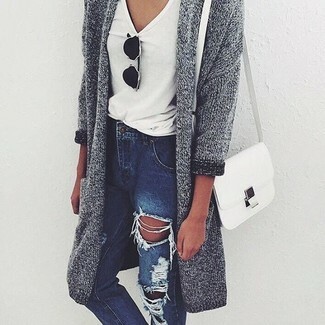 A grey knit open cardigan and Philipp Plein Fix You Morgan Fit Jeans paired together are such a dreamy getup for fashionistas who appreciate laid-back ensembles. Wear a beige oversized sweater and Philipp Plein blue ripped skinny jeans, if you want to dress for comfort without looking like a hobo to look chic. A pair of black and tan leather ballerina shoes will create a stylish contrast against the rest of the look. 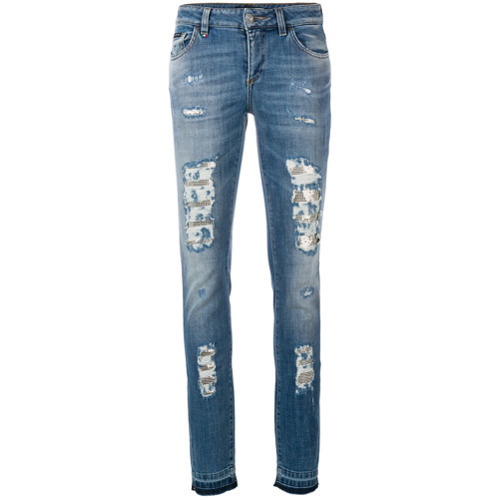 Extremely chic, this combination of a black coat and Philipp Plein blue ripped skinny jeans offers variety. Spruce up this outfit with a pair of red suede ankle boots. Pair a black leather biker jacket with Philipp Plein blue ripped skinny jeans to put together an absolutely stylish and current casual outfit. If you need to immediately elevate your ensemble with footwear, why not complete your look with black suede ankle boots? For a tested laid-back option, you can never go wrong with this pairing of a white ruffle off shoulder top and blue ripped skinny jeans. Rev up the formality of this look a bit by wearing a pair of brown leather ankle boots.